An astrophysical jet is an astronomical phenomenon where outflows of ionised matter are emitted as an extended beam along the axis of rotation. When this greatly accelerated matter in the beam approaches the speed of light, astrophysical jets become relativistic jets as they show effects from special relativity. The formation and powering of astrophysical jets are highly complex phenomena that are associated with many types of high-energy astronomical sources. They likely arise from dynamic interactions within accretion disks, whose active processes are commonly connected with compact central objects such as black holes, neutron stars or pulsars. One explanation is that tangled magnetic fields are organised to aim two diametrically opposing beams away from the central source by angles only several degrees wide (c. > 1%). Jets may also be influenced by a general relativity effect known as frame-dragging. Most of the largest and most active jets are created by supermassive black holes (SMBH) in the centre of active galaxies such as quasars and radio galaxies or within galaxy clusters. Such jets can exceed millions of parsecs in length. Other astronomical objects that contain jets include cataclysmic variable stars, X-ray binaries and gamma-ray bursts (GRB). Others are associated with star forming regions including T Tauri stars and Herbig–Haro objects, which are caused by the interaction of jets with the interstellar medium. Bipolar outflows or jets may also be associated with protostars, or with evolved post-AGB stars, planetary nebulae and bipolar nebulae. Relativistic jet. The environment around the AGN where the relativistic plasma is collimated into jets which escape along the pole(s) of the supermassive black hole. Relativistic jets are beams of ionised matter accelerated close to the speed of light. Most have been observationally associated with central black holes of some active galaxies, radio galaxies or quasars, and also by galactic stellar black holes, neutron stars or pulsars. Beam lengths may extend between several thousand, hundreds of thousands or millions of parsecs. Jet velocities when approaching the speed of light show significant effects of the special theory of relativity; for example, relativistic beaming that changes the apparent beam brightness. Massive central black holes in galaxies have the most powerful jets, but their structure and behaviours are similar to those of smaller galactic neutron stars and black holes. These SMBH systems are often called microquasars and show a large range of velocities. SS433 jet, for example, has a velocity of 0.23c. Relativistic jet formation may also explain observed gamma-ray bursts. Notably, even weaker and less relativistic jets may be associated with many binary systems. Mechanisms behind the composition of jets remain uncertain, though some studies favour models where jets are composed of an electrically neutral mixture of nuclei, electrons, and positrons, while others are consistent with jets composed of positron–electron plasma. Trace nuclei swept up in a relativistic positron–electron jet would be expected to have extremely high energy, as these heavier nuclei should attain velocity equal to the positron and electron velocity. Blandford–Znajek process. This theory explains the extraction of energy from magnetic fields around an accretion disk, which are dragged and twisted by the spin of the black hole. Relativistic material is then feasibly launched by the tightening of the field lines. Penrose mechanism. Here energy is extracted from a rotating black hole by frame dragging, which was later theoretically proven to be able to extract relativistic particle energy and momentum, and subsequently shown to be a possible mechanism for jet formation. Jets may also be observed from spinning neutron stars. An example is pulsar IGR J11014-6103, which has the largest jet so far observed in the Milky Way Galaxy whose velocity is estimated at 80% the speed of light (0.8c). X-ray observations have been obtained but there is no detected radio signature nor accretion disk. Initially, this pulsar was presumed to be rapidly spinning but later measurements indicate the spin rate is only 15.9 Hz. Such a slow spin rate and lack of accretion material suggest the jet is neither rotation nor accretion powered, though it appears aligned with the pulsar rotation axis and perpendicular to the pulsar's true motion. Galaxy NGC 3862, an extragalactic jet of material moving at nearly the speed of light can be seen at the three o'clock position. ^ Beall, J. H. (2015). "A Review of Astrophysical Jets" (PDF). Proceedings of Science: 58. Bibcode:2015mbhe.confE..58B. Retrieved 19 February 2017. ^ a b Morabito, Linda A.; Meyer, David (2012). "Jets and Accretion Disks in Astrophysics – A Brief Review". arXiv:1211.0701 [physics.gen-ph]. ^ a b c Wolfgang, K. (2014). "A Uniform Description of All the Astrophysical Jets" (PDF). Proceedings of Science: 58. Bibcode:2015mbhe.confE..58B. Retrieved 19 February 2017. ^ Beall, J. H (2014). "A review of Astrophysical Jets". Acta Polytechnica CTU Proceedings. 1 (1): 259–264. Bibcode:2014mbhe.conf..259B. doi:10.14311/APP.2014.01.0259. ^ "Star sheds via reverse whirlpool". Astronomy.com. 27 December 2007. Retrieved 26 May 2015. ^ Biretta, J. (6 Jan 1999). 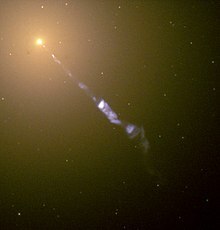 "Hubble Detects Faster-Than-Light Motion in Galaxy M87". ^ "Evidence for Ultra-Energetic Particles in Jet from Black Hole". Yale University – Office of Public Affairs. 20 June 2006. Archived from the original on 2008-05-13. ^ Semenov, V.; Dyadechkin, S.; Punsly, B. (2004). "Simulations of Jets Driven by Black Hole Rotation" (Submitted manuscript). Science. 305 (5686): 978–980. arXiv:astro-ph/0408371. Bibcode:2004Sci...305..978S. doi:10.1126/science.1100638. PMID 15310894. ^ Georganopoulos, M.; Kazanas, D.; Perlman, E.; Stecker, F. W. (2005). "Bulk Comptonization of the Cosmic Microwave Background by Extragalactic Jets as a Probe of Their Matter Content". The Astrophysical Journal. 625 (2): 656–666. arXiv:astro-ph/0502201. Bibcode:2005ApJ...625..656G. doi:10.1086/429558. ^ Hirotani, K.; Iguchi, S.; Kimura, M.; Wajima, K. (2000). "Pair Plasma Dominance in the Parsec‐Scale Relativistic Jet of 3C 345". The Astrophysical Journal. 545 (1): 100–106. arXiv:astro-ph/0005394. Bibcode:2000ApJ...545..100H. doi:10.1086/317769. ^ Naeye, R.; Gutro, R. (2008-01-09). "Vast Cloud of Antimatter Traced to Binary Stars". NASA. ^ Blandford, R. D.; Znajek, R. L. (1977). "Electromagnetic extraction of energy from Kerr black holes". Monthly Notices of the Royal Astronomical Society. 179 (3): 433. arXiv:astro-ph/0506302. Bibcode:1977MNRAS.179..433B. doi:10.1093/mnras/179.3.433. ^ Penrose, R. (1969). "Gravitational Collapse: The Role of General Relativity". Rivista del Nuovo Cimento. 1: 252–276. Bibcode:1969NCimR...1..252P. Reprinted in: Penrose, R. (2002). ""Golden Oldie": Gravitational Collapse: The Role of General Relativity". General Relativity and Gravitation. 34 (7): 1141–1165. Bibcode:2002GReGr..34.1141P. doi:10.1023/A:1016578408204. ^ Williams, R. K. (1995). "Extracting X-rays, Ύ-rays, and relativistic e−e+ pairs from supermassive Kerr black holes using the Penrose mechanism". Physical Review. 51 (10): 5387–5427. Bibcode:1995PhRvD..51.5387W. doi:10.1103/PhysRevD.51.5387. PMID 10018300. ^ Williams, R. K. (2004). "Collimated Escaping Vortical Polar e−e+Jets Intrinsically Produced by Rotating Black Holes and Penrose Processes". The Astrophysical Journal. 611 (2): 952–963. arXiv:astro-ph/0404135. Bibcode:2004ApJ...611..952W. doi:10.1086/422304. ^ "Chandra :: Photo Album :: IGR J11014-6103 :: June 28, 2012". ^ Pavan, L.; et al. (2015). "A closer view of the IGR J11014-6103 outflows". Astronomy & Astrophysics. 591: A91. arXiv:1511.01944. Bibcode:2016A&A...591A..91P. doi:10.1051/0004-6361/201527703. ^ Halpern, J. P.; et al. (2014). "Discovery of X-ray Pulsations from the INTEGRAL Source IGR J11014-6103". The Astrophysical Journal. 795 (2): L27. arXiv:1410.2332. Bibcode:2014ApJ...795L..27H. doi:10.1088/2041-8205/795/2/L27. Blandford, Roger; Agol, Eric; Broderick, Avery; Heyl, Jeremy; Koopmans, Leon; Lee, Hee-Won (2001). "Compact Objects and Accretion Disks". arXiv:astro-ph/0107228v1.